The classics in translucent "jelly" and gold. 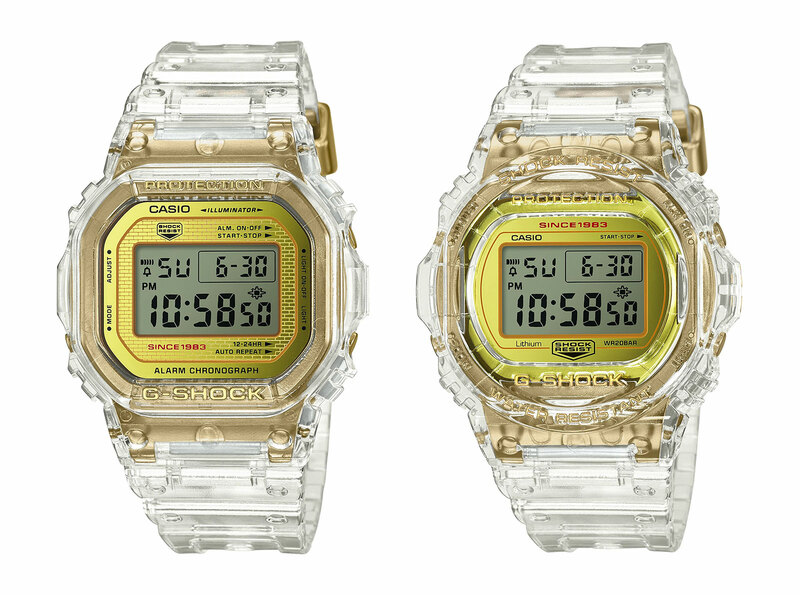 Casio has been rolling out commemorative editions over the course of the year, to mark the 35th anniversary of the G-Shock. 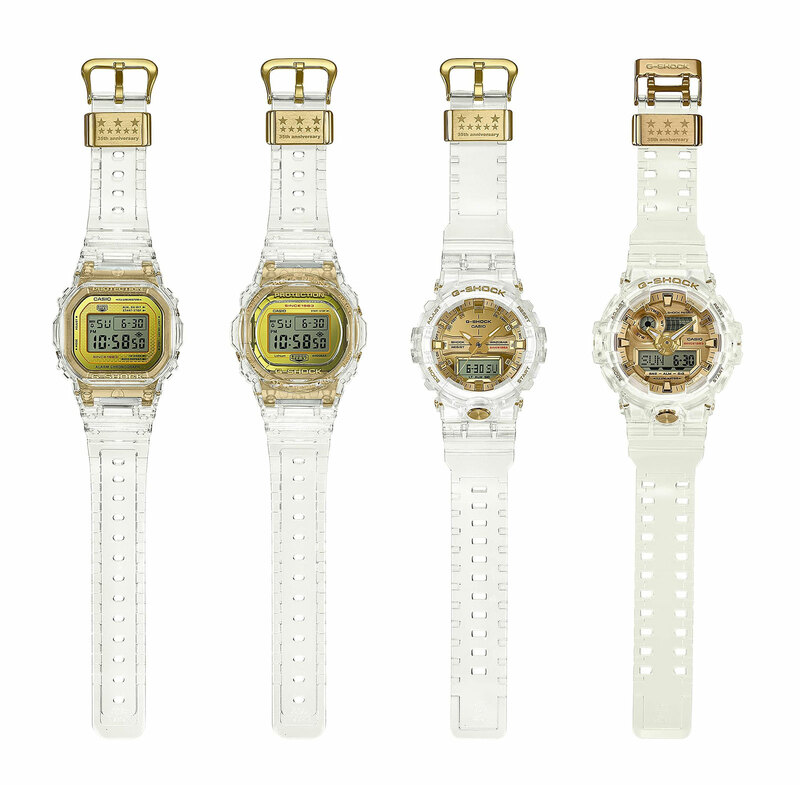 The best known is of course the G-Shock ‘Full Metal’, a remake of the original 1983 model. 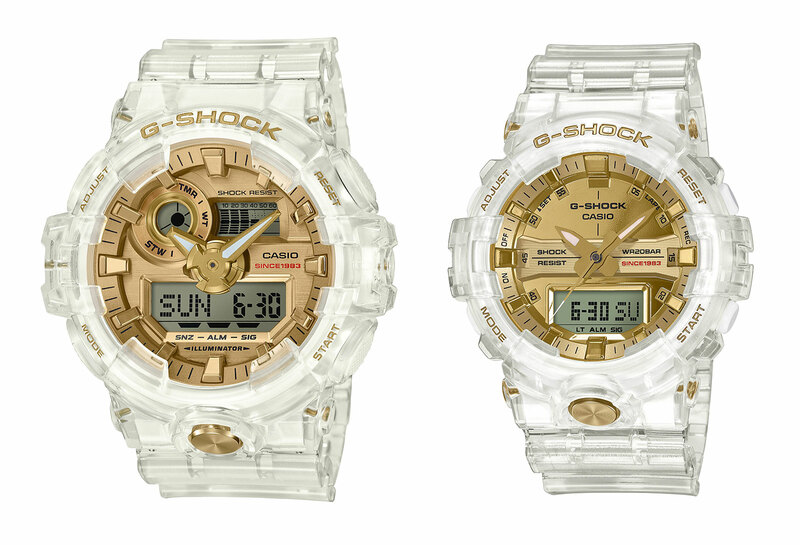 Now that’s been joined by the G-Shock Glacier Gold, a quartet of translucent “jelly” models with bright gold accents that are variations of popular models in the current catalogue. All four watches have gold-plated dials, screws, backs and buckles, along with matching translucent straps, as well as case back bearing the anniversary logo. The first two are vintage remakes. One is the DW5035E-7, with its distinctive oblong case shaped like that of the original G-Shock DW5000 of 1983. And the other is the DW5735E-7, which is based on the DW5700 of 1987, one of the earliest round G-Shock watches. Both of these have the same movement and are functionally identical, with functions including stopwatch, countdown timer and alarm. And they also have screw-down case backs, instead of a back secured by four screws. The next pair is based on more recent designs. The GA-735E is oversized and 53.4mm in diameter, and based on the GA-710. It has both an analogue and digital display, along with the most electronic functions of the range, including a 31-time zone world time and 1/10th of a second countdown timer. The smaller GA-835E is 48.6mm in diameter, with slightly fewer functions than its oversized cousin. It’s a variant of the GA-810. The Glacier Gold series is already available in stores. In Japan all four share the same retail price of ¥24,300 including local taxes. Overseas the retail prices differ between models: the DW5035E-7 and DW5735E-7 are priced at US$220 or S$339, while the GA-735E and GA-835E are US$190 or S$249. The third instalment in the top of the line G-Shock series decorated with an ancient Japanese craft. Casio combines cutting edge technology with traditional Japanese metalworking in the US$6200 MR-G 20th Anniversary "Hammer Tone". 50 years ago Lt Commander Scott Carpenter orbited the Earth in the Aurora 7 spacecraft with a Breitling Cosmonaute ref. 809 on his wrist. It was Lt Cmdr Carpenter who first mooted the idea of a 24 hour version of the classic ref. 806 Navitimer in the late fifties because it enabled him to keep track of the time while in space.